EDITORS NOTE: This Tragic Event occurred in 2011 and IS NOT a Current Event. Fort Campbell, KY – The Department of Defense announced today the death of six Soldiers who were supporting Operation Enduring Freedom. They died May 26th, 2011 of wounds suffered when insurgents attacked their unit with an improvised explosive device in Kandahar Province, Afghanistan. They were assigned to Fox Company, (Pathfinder), 4th Battalion, 101st Aviation Regiment, 159th Combat Aviation Brigade, 101st Airborne Division (Air Assault), Fort Campbell, KY.
(Left to Right) John Runkle, Jr., Edward Mills, Ergin Osman, Louis Ramosvelazquez, Thomas Bohall, and Adam Patton. 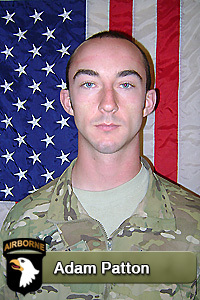 All with the 159th Combat Aviation Brigade, 101st Airborne Division (Air Assault), Fort Campbell, KY.
1st Lieutenant John Marshall Runkle Jr., 27, of West Salem, OH, was an Infantryman, who joined the Army in June 2006 and arrived at Fort Campbell in June 2010. His awards and decorations include: Army Commendation Medal; Army Achievement Medal; National Defense Service Medal; Air Assault Badge; Parachutist Badge; Pathfinder Badge and Ranger Tab. Runkle is survived by his father, John Runkle of Woster, OH and mother, Christine Runkle of Salem, OH. 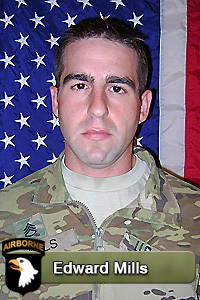 Staff Sergeant Edward David Mills, of New Castle, PA, was an Infantryman, who joined the Army in January 2005 and arrived at Fort Campbell in November 2005. His awards and decorations include: Air Medal; Army Commendation Medal; Army Achievement Medal; Army Good Conduct Medal; National Defense Service Medal; Afghanistan Campaign Medal with Arrowhead Device; Iraq Campaign Medal; Global war on Terrorism Service Medal; Army Service Ribbon; Overseas Service Ribbon; North Atlantic Treaty Organization Medal; Air Assault Badge; Parachutist Badge; Pathfinder Badge and Combat Infantryman Badge. 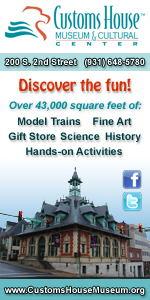 Mills is survived by his spouse, Amanda Brenner and mother, Kathie L. Greenawalt, both of New Castle, PA. He is also survived by his father, Edward Mills. Staff Sergeant Ergin Vidot Osman, 35, of Harrison Township, MI, was an Infantryman, who joined the Army in March 1998 and arrived at Fort Campbell in April 2007. His awards and decorations include: Air Medal; Army Commendation Medal; Navy Commendation with Combat Distinguishing Device; Army Achievement Medal; Navy Achievment Medal with Valor Device; Air Force Meritorious Unit Award Ribbon; Combat Action Ribbon; Joint Meritorious Unit Award; Navy Unit Commendation; Navy Meritorious Unit Commendation; Marine Corps Good Conduct Medal; Army Good Conduct Medal; National Defense Service Medal; Korean Defense Service Medal; Kosovo Campaign Medal with 2 Bronze Service Stars; Afghanistan Campaign Medal; Iraq Campaign Medal; Global War on Terrorism Expeditionary Medal; Humanitarian Service Medal; Armed Forces Service Medal; Army Service Ribbon; Navy Sea Service Deployment Ribbon; Overseas Service Ribbon; North Atlantic Treaty Organization Medal; Parachutist Badge; Air Assault Badge; Combat Infantryman Badge and Ranger Tab. 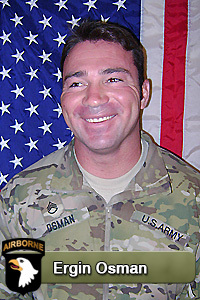 Osman is survived by his wife, Private 1st Class Kristin Osman of Hopkinsville, KY and sons, Aidan and Zeren Osman of Roseville, MI. He is also survived by his father, Mike Osman of Birmingham, AL and mother, Sarah Osman of Township, MI. Sergeant Louie Ramosvelazquez 39, of Camy, Puerto Rico, was a Combat Medic, who joined the Army in December 2006 and arrived at Fort Campbell in September 2007. His awards and decorations include: Army Good Conduct Medal; National Defense Service Medal; Afghanistan Campaign Medal; Global War on Terrorism Service Medal; Army Service Ribbon; North Atlantic Treaty Organization Medal; Air Assault Badge; Parachutist Badge and Pathfinder Badge. 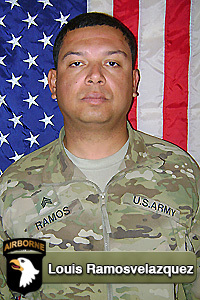 Ramosvelazquez is survived by his wife, Yesina Ramos; daughter, Sheila Ramos Hernandez; sons, Louie Ramos Hernandez and Pedro Hernandez Hernandez, all of Fort Campbell, KY. He is also survived by mother Rosie Rolon of Ridgewood, NY, father, Louie Ramos of Camuy, Puerto Rico and step mother, Rosa Velasquez. 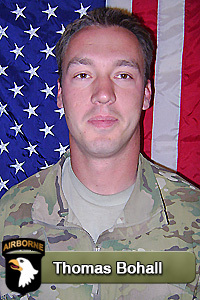 Sergeant Thomas Andrew Bohall, 25, of Bel Aire, KS, was an Infantryman, who joined the Army in August 2005 and arrived at Fort Campbell in October 2008. His awards and decorations include: Air Medal; Army Achievement Medal; Army Good Conduct Medal; National Defense Service Medal; Afghanistan Campaign Medal; Iraq Campaign Medal; Global War on Terrorism Service Medal; Noncommissioned Officer Professional Development Ribbon; Army Service Ribbon; Overseas Service Ribbon; North Atlantic Treaty Organization Medal; Air Assault Badge; Parachutist Badge; Pathfinder Badge and Combat Infantryman Badge. Bohall is survived by his wife, Jessica Bohall of Essington, PA; daughter, Annabelle Bohall of Essington, PA; father, Timothy Bohall of San Antonio, TX and mother, Lorna Geist. 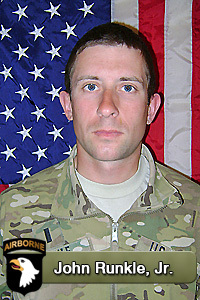 Specialist Adam James Patton, 21, of Port Orchard, WA, was an Infantryman, who joined the Army in June 2008 and arrived at Fort Campbell in October 2008. His awards and decorations include: Air Medal; Army Commendation Medal; Army Achievement Medal; National Defense Service Medal; Afghanistan Campaign Medal; Global War on Terrorism Service Medal; Army Service Ribbon; Overseas Service Ribbon; North Atlantic Treaty Organization Medal and Combat Infantryman Badge. Patton is survived by his mother, Sandra Kottre, Port Orchard, WA. A memorial service will be held for the Fallen in Afghanistan. Fort Campbell holds a monthly Eagle Remembrance Ceremony to honor fallen Screaming Eagles. 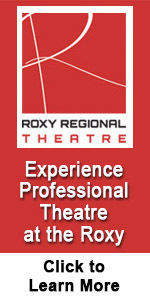 The next ceremony will be held June 8th at 4:00pm.